Former Nigerian military head of state, Ibrahim Badamasi Babangida, has spoken on why he throwin his support on 2019 presidential aspirant, Dr. Bukola Saraki. 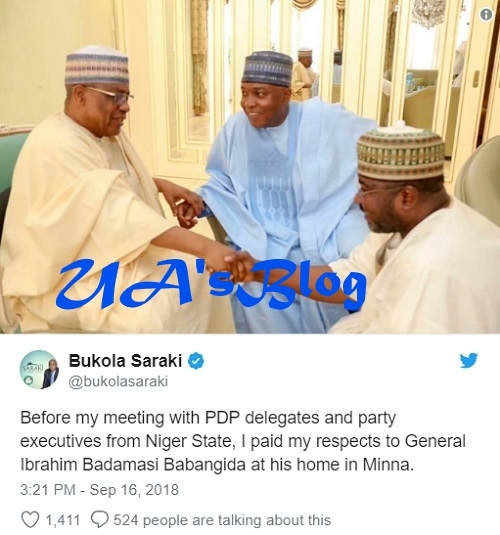 While speaking in Minna, the Niger State capital on Saturday, former military president, General Ibrahim Badamasi Babangida, threw his weight behind the presidential ambition of Senate President, Dr. Bukola Saraki. Babangida who made the disclosure while playing host to Saraki, said in supporting Saraki’s presidential bid, he was only returning a favour the senior Saraki paid him during his own presidential ambition. “it is my turn to do what your father did to me,” Babangida said, adding that he will treat Saraki as his own son and ensure that he succeeds in his bid. “I will rightly observe that you are my son, for coming to pay a courtesy visit. I remember when I was still in office, I spoke with your father, Oloye Saraki, who always provided advice on a number of things attached to this country.